While most of us gave up on our New Year's resolutions weeks ago, Saskatoon-based hip-hop producer Factor (a.k.a. Graham Murawsky) is still going strong with his plans to release a single for every month in 2014. Back in January, we heard the first piece of his Factor Friday's Single Series in the form of the Myka 9-assisted "War with Yourself." 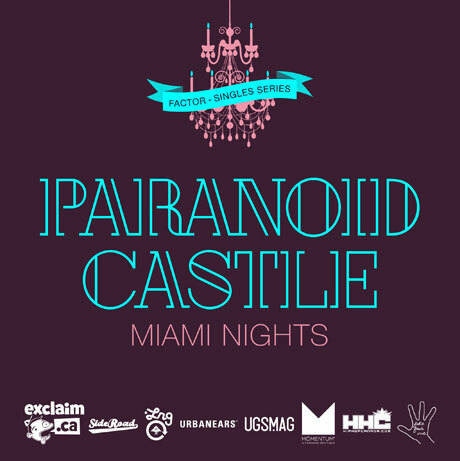 Now we're getting the second offering in his 12-part series with the sun-drenched Paranoid Castle collab "Miami Nights." Marking the newest partnership between Factor and Oakland, CA MC Kirby Dominant, "Miami Nights" finds the Prairies-meets-West Coast duo delivering neon synth stabs and swelling strings underneath's Dominant's signature breezy flow. The track is the first piece of material we've heard from the pair since their 2011 Paranoid Castle LP Champagne Nightmares and acts as a teaser for their as-yes-untitled full-length follow-up, which is due out sometime in 2014. Check out the track now in the player below, and don't forget to come back on the final Friday of every month to hear more from Factor's ongoing single series.